Harman, the Samsung owned company and creator of brands like JBL, Revel, AKG and Infinity has launched a new smart speaker in India. The Harman Kardon Allure Speaker has been launched in India in partnership with Amazon India. The Harman Kardon Allure costs Rs. 22,499 and can be purchased from Amazon only by invitation. So what makes this speaker so expensive and hard to get? The primary cause is because it is associated with a reputed brand like Harman and also because of its features. The Harman Kardon Allure is an Amazon Alexa powered smart speaker that can perform certain tasks based on user’s voice commands plus it has a 360 degree omni-directional sound with a built in subwoofer. The Harman Kardon Allure comes into play against Amazon’s Echo range because of its sound quality. Now in the past Amazon Echo range of speakers have not been the best at reproducing high quality sound but the Harman Kardon Allure gets over the problem easily since it backed by the best technical expertise. The Harman Kardon Allure has the capability of streaming audio up to 24-bit/96kHz. It has responsive lighting inside its semi transparent body that lights up in accordance with the music being played. Unlike the Amazon Echo, you can stream audio from your mobile device using Bluetooth. When it comes to Alexa, it is still as capable as an Amazon Echo. The Alexa on the Harman Kardon Allure is the same India-centric variant that can recognise Indian accent and some Hindi words as well. You can ask Alexa to stream music from Saavn, order products from Amazon, hail cabs run by Ola, work with Philips and Syska smart lights and do much more. Since Alexa stays in the cloud it is constantly learning new skills to help you out. While Amazon Echos feature a seven microphone array, the Harman Kardon Allure has a four microphone array and it comes with far-field voice recognition which means you can be in any part of the room and it will recognise your voice. 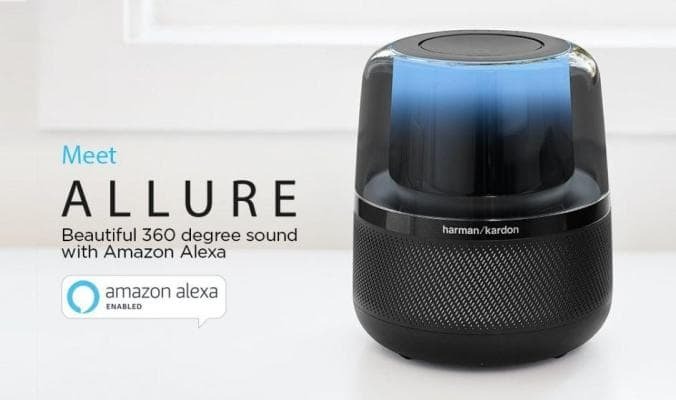 Just like the Amazon Echo range, the Harman Kardon Allure is also a AC powered speaker and needs connection with the internet via Wi-Fi to work. The Harman Kardon Allure has 3.5mm auxiliary cable support. At a price of nearly twice as expensive as the Echo Plus, the Harman Kardon Allure is only meant for audio purists, if you just want an Alexa equipped speaker you can always go for the Echo range based on your budget.